ANNVILLE (PA) – Middle Atlantic Conference (MAC) champion Delaware Valley University was well represented on the all-conference team as 19 Aggies (10 first team, nine second team) were selected to the squad. 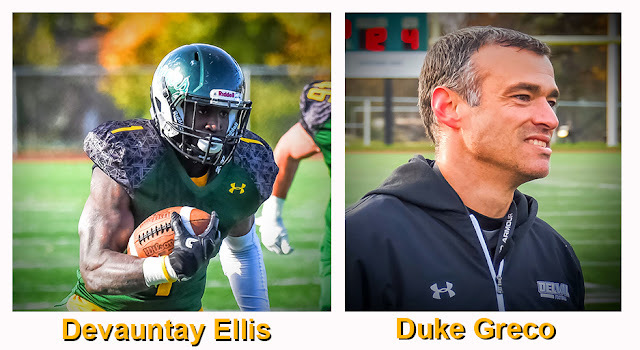 In addition, senior tailback Devauntay Ellis (Ewing, NJ/Ewing) was named the Offensive Player of the Year and Duke Greco was named the Coach of the Year. Devauntay Ellis is the fifth Aggie in the last 14 years to earn MAC Offensive Player of the Year accolades, joining quarterback Adam Knoblauch (2005), quarterback Mike Isgro (2008), running back Matt Cook (2010) and wide receiver Rasheed Bailey (2014) on the exclusive list. It is also the third straight year that he was named to the first team. This year, he is the conference’s leading rusher with 1,141 yards and 16 touchdowns on 174 carries. He has gone over the 100-yard mark four times – all in league contests – and had a recent stretch where he netted 378 yards and eight touchdowns over five quarters of play. Now in his fourth season at the helm of his alma mater, Greco joins G.A. Mangus (2003, 2004) and Jim Clements (2009, 2010, 2011) as DelVal recipients of the Coach of the Year Award during the incredible decade-plus run of success. Greco has already amassed a 37-6 record as a head coach and he led the Aggies to the fourth 10-0 regular-season record in program history (2004, 2005, 2011), the MAC championship and an NCAA playoff berth. Miller was selected to the all-conference first team for the third time in his career. The preseason All-American leads the team with five interceptions and he has returned them for 88 yards and two touchdowns. He is second on the team in tackles with 49 and also has three pass breakups and a blocked kick to his credit. Sylvester picked up his third straight all-conference honor and his first on the first team (second team in 2015 and 2016). The center has been the anchor of an Aggie offensive line that has helped the team average 40.2 points and 431.5 yards. DiGati received his second consecutive first-team accolade. He leads the team in tackles with 74, including a 21-tackle performance (second-highest, single-game total in school history) at MAC foe Wilkes University. Nine of his stops have been behind the line of scrimmage. McBryde was a second-team pick as a rookie last year and he moves up to a spot on the first team in 2017. The safety is second on the team in both interceptions (four) and pass breakups (four) while also adding 35 tackles. Both Walsh and Wright picked up the second all-MAC honors of their careers after both were honorable mentions a season ago. For Walsh, the right tackle has helped pave the way for the DelVal running game to average 255.4 yards per game and 6.1 yards per attempt. Wright has twice been named the MAC Defensive Player of the Week this season. His numbers include 42 tackles, four pass breakups, three interceptions and three sacks. Wright has also scored three touchdowns (interception return, fumble return, blocked punt return) and a safety for 20 points. Adams, Prevard and Snowden were named to the all-conference team for the first time in their careers. Adams is sixth in all of Division III in punting with an average of 41.8 yards per boot. He has placed 13 of his punts inside the opponent’s 20-yard line and five of kicks have gone for 50 or more yards. Prevard’s rookie campaign has seen him be a force on special teams as well as a defensive back in nickel situations. He has 22 tackles, one interception and one safety to his credit. Snowden, an end in the 3-4 defensive alignment, has a team-high 17 tackles behind the line of scrimmage (46 tackles overall). He is tied for the team lead in fumble recoveries with three and is second in sacks with 4.5. Darden was picked to the all-MAC team for the second straight season as he was an honorable mention in 2016. This year, he has completed 125 of 221 passes for 1,632 yards and 20 touchdowns. Darden has also rushed for 575 yards and seven scores, including a 133-yard, four-touchdown performance in last week’s conference title-clinching win over Widener University. Mohr earned a spot on the second team for the second consecutive year. The cornerback is tied for the team lead in pass breakups with six. He has also recorded 28 tackles and three interceptions and his two-point returned of a blocked extra-point attempt started a run of 41 consecutive points in the win over Widener. Allen, DiLeo, Marquis Ellis, Isaac, O’Neill, Ockimey and Syracuse were each selected to the all-conference team for the first time in their careers. Allen is second on the team in receiving yards (302) and receiving touchdowns (four) and has 16 catches overall. DiLeo, an end in the 3-4 defense, leads the Aggies in sacks with five while his 11 tackles behind the line of scrimmage rank fourth. He has 25 overall stops. Marquis Ellis is the team’s leading receiver thanks to 27 catches for 373 yards and seven touchdowns. Six of his scores occurred in conference contests. Isaac clogged up the middle of the defense for DelVal from his nose guard position. His season totals include 11 tackles with four coming behind the line of scrimmage. O’Neill has been a valuable blocking back for the Aggie offense. He has helped the squad notch at least 24 points in each game this season, including five efforts of 40 or more points. Ockimey is tied for the team in both pass breakups (six) and fumble recoveries (three). He is also third in sacks with 3.5 and fifth in tackles with 40. Syracuse has the blind side blocking duties at left tackle. He has helped the team allow just 10 sacks on the year (seven over nine MAC games) while the offense has recorded 51 touchdowns. DelVal begins NCAA championship play on Saturday, November 18 (12 p.m.) when it hosts Western New England University in the first round. It is the team’s 14th postseason berth in the last 15 years, including seven NCAA appearances.